EW Live 2019 Tartu, Estonia, 2019. April 9-11. 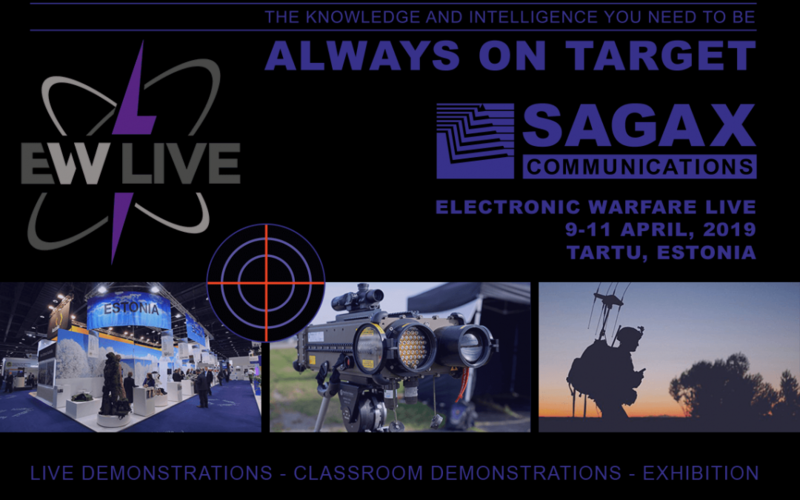 Electronic Warfare Live – EW Live will be returning to Estonia in 2019 and once again featuring live field and classroom demonstrations from over 20 companies as well as a new counter drone zone featuring live drone scenarios. We proudly announce, that Sagax Communications will be one of the participants out of that great companies in the industry. We will represent ourselves at the exhibition booth, deliver classroom presentation for the registered teams, and introduce our integrated receiver system based on our search-intercept receiver and monitor-collect receivers. EW Live 2019 will emphasize the importance of sharing electronic spectrum knowledge and operational experience in the context of the 21st Century Battlefield. The demonstrations will bring together military, operational and industrial technical excellence within a professional LIVE environment. A live COMINT & ELINT threat spectrum setting (as indicated in the image right) will present the threat context to current and new types of EW operational equipment. In close proximity to Tartu Airport is Tartu Military Air Base at Raadi Airfield. Tartu Airport is also adjacent to the Estonian Aviation Academy which provides education and training to specialists for Estonian aviation enterprises and organisations including close cooperation with Estonian Air Force, Estonian Border Guard Aviation Group & Estonian National Defence College. The EW Live exhibitors will present their brand new products in the fields of electronic defense systems, for example counter drone technology, both theoretically and in live action. Many international delegations are expected from around the globe. More than 20 countries will send their representatives and numerous independent visitors are showing up. We look forward to seeing you in April! Sagax Communications – Always on Target.